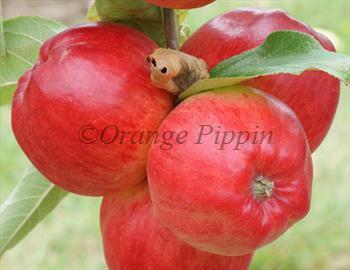 Redfree is an attractive modern summer apple, with a high level of disease resistance. As well as excellent resistance to scab it also has good resistance to fire blight and cedar apple rust. The apples have a crisper texture than is normally found in summer apples, and can be kept in a fridge for several weeks after picking. Fill in the details below and we will let you know when Redfree apple trees are back in stock. Redfree is easy to grow and adapted to both cold and warm climates, but flavor is generally better in cooler areas. Thanks to its unusual parentage, which includes a scab-resistant crab apple, Redfree is a good pollinator of many other apple varieties. Redfree is one of the most resistant varieties to cedar-apple rust, and is therefore a good choice if you live in an area where CAR is present. Redfree was developed by the co-operative breeding program at Purdue, Rutgers, and Illinois universities. It was known during development as Co-op 13 and was released in the 1980s.